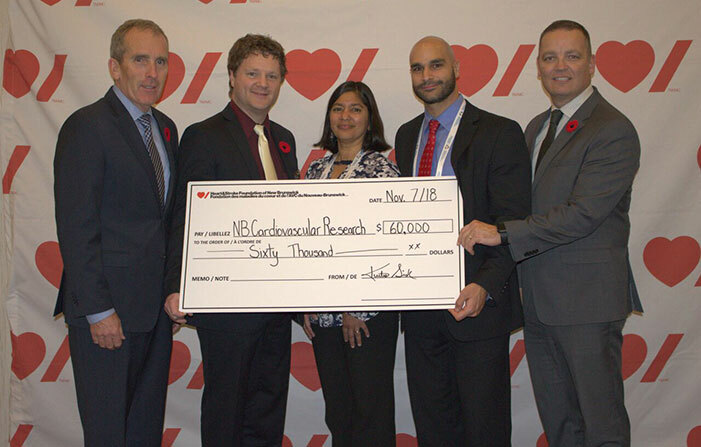 UNB’s Dr. Neeru Gupta, Dr. Keith Brunt and Dr. Martin Sénéchal were the recipients of three research grants at the 10th Annual NB Health Research Conference on Nov. 7. In her study, Dr. Gupta plans to use large-scale data resources to examine gender differences in the risk of preventable hospitalizations for diabetes and cardiovascular disease between Canadian men and women, factoring in a wide range of health and social factors, such as income inequality and social marginalization. She is hopeful that this study will strengthen the evidence base on the gender gap in cardiometabolic health. The project will draw on population-based data for policy-actionable health research, and will also provide training and mentoring opportunities and collaborations for UNB and its partners. Dr. Brunt, an adjunct professor at UNB’s faculty of business and associate professor at Dalhousie Medicine New Brunswick, also received $20,000 toward his project, “Understanding the Cellular and Molecular Mechanisms Relating a Novel and Sexually Dimorphic Cause of Diastolic Dysfunction.” The long-term objective of his study is to discover new ways of treating heart disease that principally affect women and have no known treatments. Dr. Brunt’s study is unique in that the focus of the research will evaluate a disease predominantly affecting women. Female subjects and experimental models have historically been neglected or under-represented in both pre-clinical and clinical research. Dr. Brunt's team has established new experimental models in females and identified potential new treatment strategies that could be revisited by the pharmaceutical industry. The research team includes members of the New Brunswick Heart Centre in Saint John to help identify and compare the experimental models to patients with the same condition, called HFpEF (Heart Failure with preserved Ejection Fraction) that affects predominantly women. “This research will provide new fundamental knowledge as to how heart disease can occur spontaneously and define how the disease progresses in both females and males to impact them in unique ways,” he says. Dr. Sénéchal, an assistant professor with UNB’s faculty of kinesiology, received $20,000 for his project, titled “Is the One Size Fits All Exercise Prescription the Appropriate Response to Preventing Cardiovascular Risk Factors in New Brunswick?” In his study, Dr. Sénéchal plans to investigate the variability of people exercising from an insulin resistance perspective, which is a strong predictor of cardiovascular disease. “Many people exercise and although on average, the improvement in health outcome is observed, there is quite a lot of variability among participants,” he says. “We will investigate if changing the exercise parameters will reduce this variability, and enhance the number of individuals who response or truly improve their insulin resistance. This would help to tailor exercise prescription, increase awareness of the efficiency of exercise, but even more importantly provide more effective exercise intervention for people at risk of cardiovascular disease”. All three awards were partially funded by the Heart and Stroke Foundation of New Brunswick. They were created to build and promote the health research capacity within the province. According to Heart and Stroke Foundation, heart disease and stroke are the leading cause of premature death for women in Canada. Women continue to be under-researched, under-diagnosed, under-treated, under-supported and under-aware of their risks. As a result, they’re over-dying. Additionally, diabetes increases the risk of high blood pressure, atherosclerosis (narrowing of the arteries), coronary artery disease and stroke, particularly if patient’s blood sugar levels are poorly controlled. It can also result in circulation problems caused by damage to the blood vessels.